Newmarket trainer Amy Murphy scored her first Grade One winner when 4/1 shot Kalashnikov, ridden by Jack Quinlan, won the G1 Devenish Manifesto Novices' Chase by a length and a quarter from 7/4 favourite La Bague Au Roi. Murphy said: "Unbelievable! I am hugely proud of our team. We only have 10 jumpers, so to produce a horse like that - I'm delighted for them. To have three runners here today... I couldn't do any of it without them behind me. "What a ride from Jack. He rode him like he was the best horse in the race and pounced late. I promise you - I know I bang on, but this horse is top-class and we've seen that today. We've had a couple of things go wrong this season but today he at his very best. "It couldn't have gone better at the start of the season [he won his first two novices' chases] and then we had Sandown [he was beaten 19 lengths by Glen Forsa when odds-on favourite] and then Cheltenham [he unseated Jack Quinlan at the sixth fence when badly hampered in the Arkle], but this is a great way to finish the season. It's great to get my first Grade One winner for my father [Paul, who owns Kalashnikov]. "I think I lost my shoes twice out there but somehow I've survived!" Jack Quinlan enjoyed a career-first G1 win when landing the Devenish Manifesto Novices' Chase on his regular ride Kalashnikov, on whom he won last year's G3 Betfair Hurdle at Newbury. 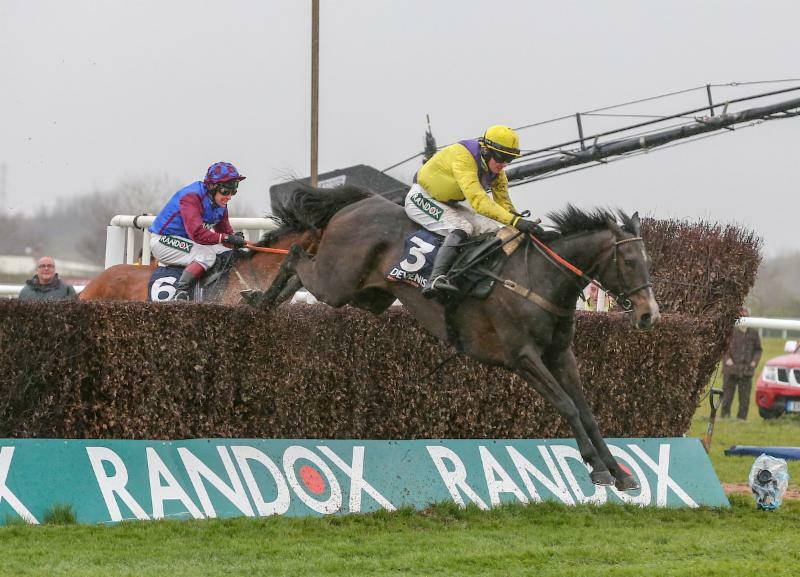 There were a couple of minor frights for Kalashnikov, who had unseated Quinlan when badly hampered at the sixth fence in Cheltenham's Racing Post Arkle Novices' Chase, but he was strong from the second last, where he had put down, and scored by a length and a quarter from favourite La Bague Au Roi. Quinlan, who is 28 and a son of Cheltenham Festival-winning trainer Noel Quinlan, said: "I'm lost for words really. You work all your life for this. This makes all the mornings and late nights worthwhile." He added: "We were obviously gutted after Cheltenham, though it was too far out to know how he would have done, but he travelled and jumped so well up to that point, which he hadn't done at Kempton and Sandown." Asked about the step up in trip, he replied: "I was one hundred percent happy to step, especially on a flat track. We stuck to two miles at Cheltenham, but coming here the flat track and two and a half miles really suited him. "He ran a blinder in the Supreme last year when just touched off by Summerville Boy, then his first two chase starts against lesser opposition were good, but there's no getting away from it, he was disappointing at both Kempton and Sandown despite finishing second in Grade 1s. That's the real him today." In reference to the jumping, he said: "He knew where he was going to take off at the first, and he's fine when he gets in short, so I was happy with him there, but then two out at the ditch I gave him a squeeze and he pout down, but otherwise he was very good." Warren Greatrex was magnanimous in defeat following 7/4 favourite La Bague Au Roi's second-placed finish to 4/1 shot Kalashnikov in the opening race of the Randox Health Grand National Festival, the G1 Devenish Manifesto Novices' Chase. La Bague Au Roi made most of the running in the two mile and four furlong event, but was outbattled in the home straight by Kalashnikov, who scored by a length and a quarter and provided Amy Murphy with a first G1 success. Greatrex said: "Richard Johnson just said she didn't run with her usual zip. From four out, he was trying to press on and when you usually do that she is away and gone. However, today Richard just felt he couldn't get her going. She was just a bit flat today. "La Bague Au Roi has had an amazing season. She's won two G1s and a G2 in five starts, so we're delighted. "Of course it is disappointing not to win today for the team and the owners, but credit must go to Amy and Kalashnikov - today is their day. "I think her first target next season will be the King George VI Chase at Kempton Park on Boxing Day." Johnson commented: "La Bague Au Roi ran really well again and we can take nothing away from the winner who probably appreciated the step up in trip." The Gordon Elliott-trained Mengli Khan (7/1) was a further length and three-quarters back in third. His jockey Jack Kennedy added: "Mengli Khan ran a cracker. He walked into the third last which took the stuffing out of him a little bit. "He probably wouldn't have beat the winner, but he's run well." Trainer Gordon Elliott will make history with a record 13 runners in Saturday's £1-million Randox Health Grand National. He wasted no time in getting into Aintree's winner's enclosure today when Mengli Khan, who he trains for Gigginstown House Stud, finished third in the G1 Devenish Manifesto Novices' Chase. Ridden by Jack Kennedy, the gelding finished one and a quarter lengths and one and three-quarters of a length behind winner Kalashnikov (4/1) and La Bague Au Roi (7/4f). Elliott said of Mengli Khan: "He ran well, but just missed [made an error] at the third-last which didn't help. He will go to Fairyhouse [April 21] for the [G1] Ryanair [Gold Cup] Chase." Tiger Roll, who won last year's Randox Health Grand National and is favourite to land back-to-back runnings, could become Elliott's third winner of the big race, Silver Birch having been the first in 2007. He said of Tiger Roll: "He's been a horse of a lifetime. He's in great form and he travels over tonight. I wouldn't want to see too much more rain - I don't want it to be too testing. We're looking forward to it. "The way he won the [G2] Boyne Hurdle and at Cheltenham [Glenfarclas Cross Country Chase] suggests he's better than ever and we're very lucky to have him. His form looks better than ever, but this is his toughest test of the season. It's the Grand National and I'm under no illusions, but if he wins it will be a great story. Since Cheltenham we've just tipped away with him - that was the main target, but the National was in our thoughts, too." When Bristol De Mai came out of the race earlier this week the weights went up 4lb, meaning Tiger Roll, who is small in stature, now carries 11st 5lb. Elliott said: "It is what it is - every horse has gone up 4lb. It's not what I wanted, but that's the way it is. "He's a gentleman of a horse, but he's a boyo as well, and he's not a child's pony. "I'm lucky to have 13 runners - that's not pressure, it's a pleasure. But you need a lot of luck in the National. We'll enjoy the day. Martin Pipe [his former boss] had 10 runners one year and I told him I would declare 11 just to beat him! We've put 13 in in case anything happens to one or two! "Of the other runners, Jury Duty is in good form and won well at Down Royal last time out, A Toi Phil is an outsider with a chance and Dounikos jumps and stays well. Don Poli and Outlander are selling tonight [at Goffs UK Aintree Sale in the winner's enclosure after racing] and I'm hoping they sell well and their new owners leave them with us - they are both Grade One horses and they have served us well. "I've won the Grand National twice and they were two of the best days of my life. It would be amazing to do it three times." Jack Quinlan, rider of the 4/1 winner Kalashnikov, said: "It is good to soft." Richard Johnson, partner of the one and a quarter-length second La Bague Au Roi (7/4 favourite), said: "It is good to soft and getting slower all the time." Jack Kennedy, jockey of third-placed Mengli Khan, said: "It is dead." Sean Bowen, partner of Bags Groove (fourth), said: "It is on the slower side of good." Harry Skelton, jockey of Spiritofthegames (fifth), said: "Soft." Jonathan Burke, on board Glen Forsa, said: "Good to soft."